Brookhollow Lane: I Heart You! Here is my little entry way table. This antique jar I found at an antique mall awhile back. I love it for putting seasonal stuff in. My little vignette is all about hearts. 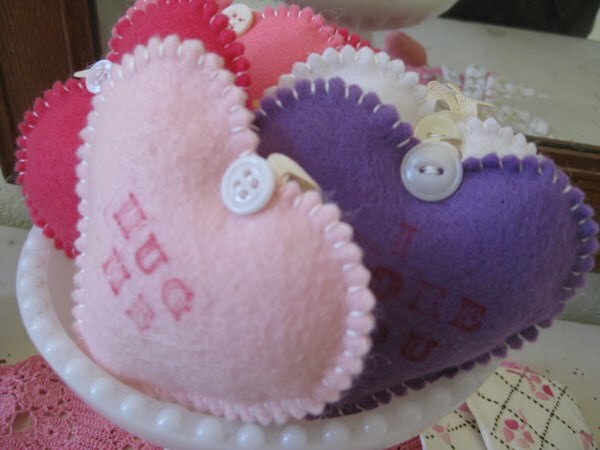 These felt conversation hearts were inspired by Elizabeth at Bluebird Papercrafts. If you haven't seen her blog go check it out. You are in for a real crafty treat! The little plate and milkglass candy dish were found at Good Will a few months ago. I had to buy the vintage gloves. They are embroidered with a black running stitch and little pink flower design. Don't know how they did that. 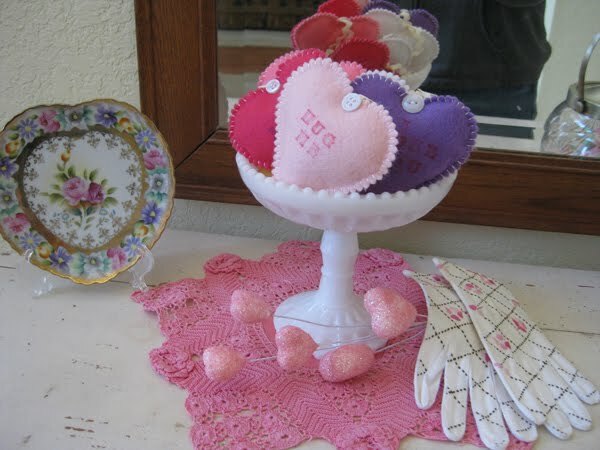 Thanks for all the Dollhouse Sweet Shoppe love. You guys are awesome. It was 75 here today-sorry all you guys that have below freezing weather. I felt like planting a gardenit was so beautiful, but it's supposed to change midweek to maybe freezing rain. We are hosting the Super Bowl here in the Dallas area-so hope you all are watching! Have a great day! That is a really cute antique jar with lid and handle!!!! Beautiful Valentine vignette at your front entrance...very pretty. I love it, it is so adorable!! 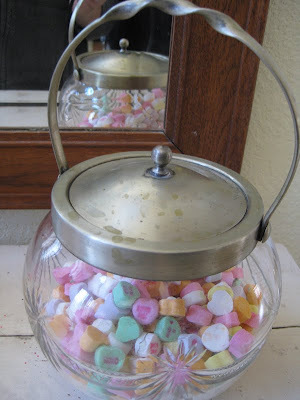 Love the conversation hearts in the jar and those felt hearts are the cutest ever!!! Great job!! Love the hearts. I was hoping to get some made before Valentine's Day. Guess I better get busy tomorrow. I'm hoping to display mine on the dining room table with a few vintage pink Shiny Bright ornaments. I was going to send you a private email in reply to your email to me but it said your address was "no reply comment", so I came over here. I'm so very sorry to hear your daddy is in the hospital too! Hoping they figure out his BP problem lickety split and all is well. Please know you are in my thoughts. Sending you lots of hugs and thank you so much for your kind emails in the midst of your own concern over your father's illness! What's up, just wanted to tell you, I loved this blog post. It was inspiring. Keep on posting! to this point? I surprised with the research you made to make this particular submit amazing.